If you were paying attention to Apple's announcements of AirPort Express and the new dual-2.5GHz G5s last week, you may have missed another, non-Apple announcement that adds another spin to the concept of getting your digital music collection into your living room. 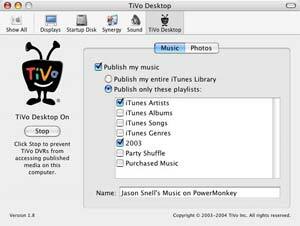 Among the new-free Home Media Option features are two that require the use of TiVo Desktop, a preference pane that runs on Mac OS X. Turn on TiVo Desktop and you can share the contents of your iPhoto and iTunes libraries with the TiVo. What this means is that now when you buy a TiVo and attach it to your home network via Ethernet or AirPort (via an add-on USB adapter), you can use your TV set as an interface for playing back MP3s from your music library -- no iTunes required. You can also view iPhoto slideshows right on your set, via the same interface.